Within the call centre and telemarketing industry there is a mythical creature that sets up a business, hides its identity, doesn’t care for the rules, makes its money and then disappears into the night. 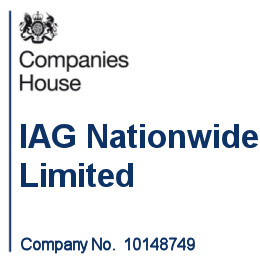 You could be forgiven for thinking that Stockport based IAG Nationwide Ltd might be one such company. Compliance these days is a nightmare on so many different levels, but it can be frustrating to those businesses trying to do things properly to be faced with competition from companies like IAG Nationwide Ltd who, or so it would appear, adopt aggressive telemarketing tactics, hide their identity, don’t operate proper Do Not Call (DNC) procedures and break the rules by calling people registered with the Telephone Preference Service (TPS). We look at companies like that and think to ourselves “How do they get away with it?”, well whilst it may seem that they often do, clearly IAG Nationwide ltd didn’t and here’s why. It took only 62 complaints received by the TPS and the Information Commissioners Office (ICO) over an eighteen month period (bear in mind they work together on complaints) between May 2016 and November 2017 for IAG to hit the ICO’s radar. Pretty much every Monetary Penalty Notice (MPN) issued by the ICO contains some quotations from the consumer complaints that contributed towards the investigation. To be honest, most of these complaints relate in the main to the unavoidable by product of a call centre industry. Rather like roads have traffic, computers crash and my takeaway order will always be delivered in “about an hour”. The complaints against IAG though were not quite so. One caller was allegedly threatened with court or jail if they did not take up IAG’s services. Another was harassed to such a degree they felt IAG were hunting them down. There was also one case where failing to get a sale from the woman of the household, IAG insisted only the husband could close the case. There may be more to these complaints that first meets the eye, but all the same, it sounds like IAG employed very aggressive sales techniques to achieve their goals. The ICO then spoof called IAG and when asked who they were the operator replied “Insurance Advisory Group”. Nothing wrong in a trading name, but if you want to use a trading name we’d advise that you get it added to your ICO licence and make sure you make it known that your business uses that trading name by promoting in your website for example. If you don’t, it could look like you’re trying to avoid being identified. To make matters worse, the operator refused to confirm the business trading address and instead gave the caller an email address to contact the company on, which did not exist. A more common aspect of the ICO investigations nowadays is that they will go directly to your telecoms operator to get call logs and statistics. 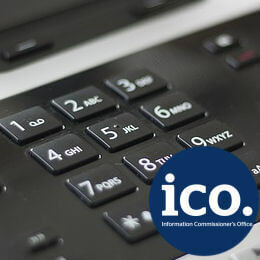 The ICO travelled down the chain of supply to IAG’s telecoms provider who provided them with their telecoms and dialler services. The telecoms provider in turn provided the ICO with everything they needed to establish how many calls IAG had made, to whom, how many times they had called the same people and how many numbers were registered on the TPS. In total, IAG’s telecoms company confirmed that they had dialled 506,188 calls between May 2016 and August 2017 of which 69,317 were registered with the TPS. You can’t rely on your data supplier to have screened your data purchases against the TPS. If you purchase data from a data supplier, it is still your responsibility to TPS screen it and to continue TPS screening it every 28 days at a minimum. It doesn’t matter how you try and wiggle out of that, it won’t wash.
To call numbers registered on the TPS you need proper consent. IAG bought data from a third party and thought that a general “selected third parties” opt-in would allow them to override and call numbers registered on the TPS. WRONG! The only way you can call data registered on the TPS that you’ve acquired from a third party data supplier is if the data is specifically opted into your business at the point of collection. Confused how the TPS works? During the investigation, IAG admitted they did not understand how and when the Privacy Electronic Communications Regulations (PECR) applied to numbers registered on the TPS and how that impacted when they could or could not call them. So they didn’t get away with it? No. 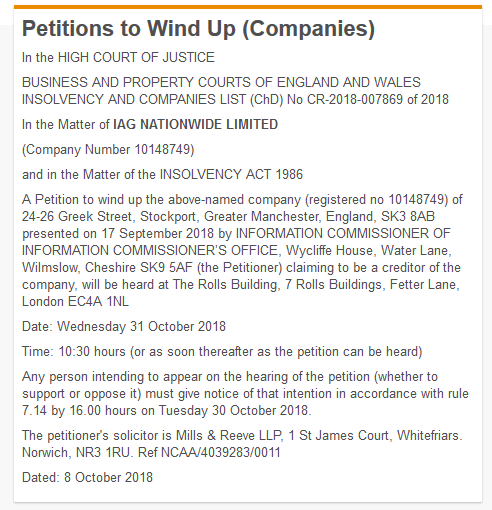 The ICO issued a winding up petition against IAG on the 8th October 2018. Historically, once the company had ceased to trade, that would be the end of it. Not anymore. The ICO have undoubtedly issued the winding up petition not only to force the company out of business, but to force it into liquidation. Once in liquidation, the ICO will appoint their own liquidators who will, we assure you, make the lives of the two directors of IAG Nationwide very difficult indeed. The ICO will probably also, working with the Insolvency Service, seek to get both company officers banned as directors. Companies operating in this way make it difficult for legitimate businesses to keep trading. Whilst IAG have been caught, it was only as a by-product of the complaints. There will be many other companies like IAG out there, not getting caught. Operating like IAG is no longer a cheeky chappie persona, but actually a real problem for the UK telemarketing industry as a whole. “Whichever way you want to look at it, hiding your identity and your address from consumers who call you is a clear indication that you don’t want to be found and moreover that you know that you’re doing something wrong. Lack of a website is not a crime, but it supports that same ethos. IAG broke many rules and it would not surprise me if the ICO sets about working backwards to those companies that took leads from them as they often get hold of the company’s bank statements as part of their investigations.